DP60 Digital Piano by Gear4music + Accessory Pack — An exceptional quality digital piano, with all the professional features of name brand alternatives, at an attractive price. 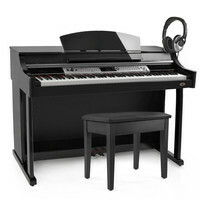 This stunning polished ebony digital piano from Gear4music features 88 professional standard fully-weighted keys, soft, sostenuto and sustain pedals, three levels of touch control and thirty one levels of reverb and chorus, providing both a top-of-the-range feel and sound. Pack comes complete with piano bench and headphones. Along with its soft, sostenuto and sustain pedals, the DP60 also has 88 hammer action, professional grade, fully weighted keys, and three levels of key touch sensitivity, giving it all of the physical qualities and feel of a real piano. As well as possessing these physical qualities, this instrument also features thirty one levels of reverb, and four levels of chorus, allowing you to find the perfect sound and resonance for your performance. As well as 11 voices, the DP60 also contains 20 styles to play along with, and 60 songs which you can listen to, play along with and learn. It also contains a record and playback function, so you can record and listen back to what you have just played, which, along with the tempo tap and a bleep metronome, is an invaluable practice tool. The included polished ebony stand and 3-pedal board ensure that the DP60 will function as a great acoustic piano replacement, as well as becoming an attractive part of your home. A great opportunity to get the important features which you would normally only find on a much more expensive instrument, without having to break the bank. Don't miss out on owning this exclusive Gear4music product!